Great service comes as standard in this friendly family owned and run Inn sitting 500 feet high in the Mendip Hills. Ideally situated to explore the surrounding area, the Penscot Inn is packed full of character. Its 10 ensuite rooms with original features and comfortable beds ensure a peaceful night, leaving you ready to sample the freshly cooked English breakfast on offer every morning. 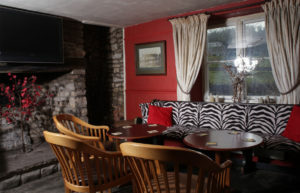 Our cosy bar boasts local ales and enough locally made ciders to keep you busy for the evening. Food at the Penscot is simple and unfussy, prepared on the premises from locally sourced produce, there is something for most appetites, small portions, hearty dishes, sandwiches. Many of our dishes are gluten and lactose free, just ask we are happy to help. Food is available daily 12 – 9pm Sunday 12 – 8pm. All rooms are en suite with either bath or shower, fluffy white towels and organic soap and shampoo. The decoration is individual with simple furniture, comfortable beds and a desk if you need to work, wifi is free and we provide tea/coffee with biscuits for dunking to help you relax. Whilst we do not have hairdryers in every room we have them available, just ask at the bar. Downstairs is in 3 areas. The cosy unpretentious bar area with log fire in the winter and French doors to the village green is a great place to join in with the lively conversation, sample the cider, enjoy our homemade cakes and scones or just chill and take advantage of the free wifi. There is also a tv area where we show major games and events shown on terrestrial tv/BT sport. Then there is the garden room, casually stylish with Lloyd loom chairs and views on to the courtyard garden, a fantastic place to enjoy our menu with friendly relaxed service and great wines. *please note we cannot guarantee a nut free environment.